These days, there’s no denying that we live in a very high-tech world. Even our children spend hours a day accessing the internet from smartphones, tablets, and home computers. 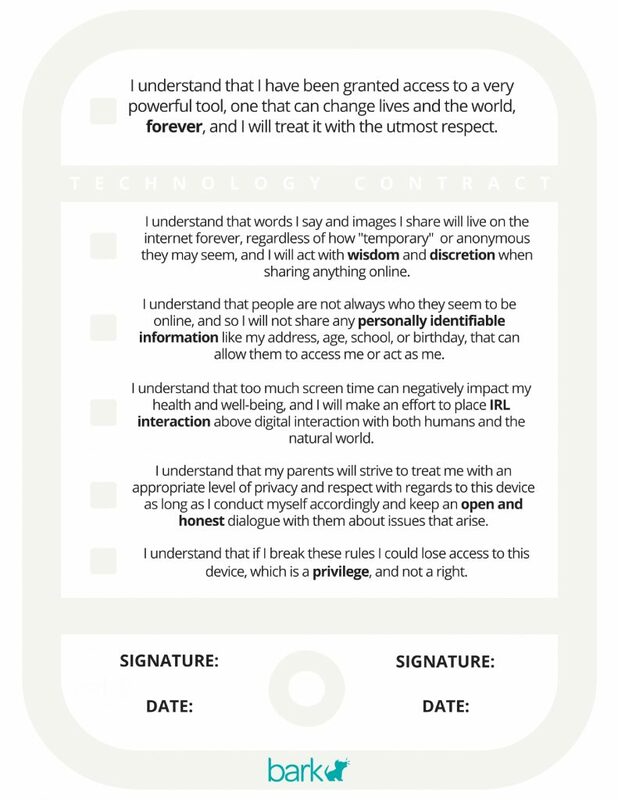 Bark recommends a technology contract as a terrific way to bring the family together to create and understand the rules around using devices and accessing the internet. Here is a contract you can download, discuss, print, and sign with your child, and below are some tips for creating a more customized agreement should you need one more suited towards your family dynamic. Today it seems that children are given devices at earlier and earlier ages, as parents feel the pressure to stay connected throughout the day with their children. Also, many of their child’s friends have smartphones and tablets, and chances are good that at least one friend has his or her very own laptop computer. 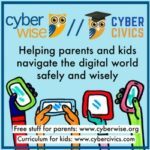 If you choose to give your child a piece of technology, whether it’s a smartphone, a tablet, or even a computer, consider telling him or her that you own that equipment and that you are loaning it to him or her in good faith. In fact, you can even require a technology contract in exchange for providing the technology in the first place. The most important thing about giving your child a tool to access the internet is a discussion around the opportunities and dangers that exist on the internet. While the internet offers amazing possibilities for learning and connecting, keeping your child safe online is a crucial component to allowing access. Here are a few points to consider. Depending on your child’s age, you get to set your their password for any and all accounts he or she will access, and your child is not allowed to change those passwords. With older children, you may want to consider letting them set their own passwords. 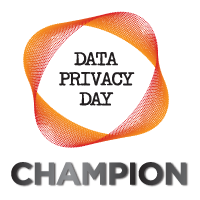 With either approach, including a monitoring tool like Bark will provide an extra level of safety to their online lives. You have a right to look through the phone, tablet, or computer at any point to see whom your child is talking to and monitor the sites he or she visits. Your child cannot use Skype or other video technologies to talk to strangers, and he or she is not allowed to provide any personal information on any forum or website without your permission. For teens that may have their driver’s license, no texting or talking on the device when driving. If at any time your child disobeys the rules you set for the technology, the consequences can include the loss of privileges associated with their device, or possibly even losing access to the device for a set time period. Each family will have their own ways of dealing with breaking the rules, but the most important aspect is that there are rules around having a device and consequences for misuse. Remind your child that you’re a team and that you’re in this together. Mistakes will happen, but you’re there to discuss it with them and learn together. Along with setting rules that are designed to keep your child safe, it is also important to help your child understand that there is basic etiquette for using the device and accessing the internet. For example, you could set rules about turning the device off in certain public places like restaurants or at the movies. Consider a rule where the whole family puts their devices away while having dinner, or everyone leaves their devices in the kitchen while sleeping. You could also set some rules for social behavior, not using the device to lie, fool, or hurt others. Remind them to be a good friend first and not promote hurtful messaging by others. Finally, if your child is old enough to access social media sites, teach him or her the basics of privacy and require him or her to follow the rules you set forth. A technology contract is a great way to not only ensure that your child respects his or her property, but also to help him or her stay safe when accessing the internet and respect others at the same time. For the most part, it’s about setting simple rules and following through with the consequences if the rules are broken. We like the Smart Talk tool the National PTA shares with families which allows your family to build a technology contract together and print it out for displaying in your home. With a technology contract in place, everyone in the family can refer to it for clear expectations and actions. And finally, our children watch our behavior so be sure to model the behavior you wish your child to emulate.